Raised in Texas, Orbison began singing in a rockabilly and country and western band in high school. He was signed by Sun Records in 1956, but his greatest success came with Monument Records in the early 1960s. From the late 1960s to late 1970s, Orbison was marred by a number of personal tragedies while his record sales declined. He experienced a resurgence in popularity through the success of several cover versions of his songs and the use of his 1963 song "In Dreams" in David Lynch's film Blue Velvet (1986). In 1988, he co-founded the Traveling Wilburys supergroup with George Harrison, Bob Dylan, Tom Petty, and Jeff Lynne. Orbison recorded his last solo album, Mystery Girl, the same year but died of a heart attack shortly thereafter. According to musician and author Albin Zak, the studio (with sound engineer Bill Porter, who experimented with close miking the doo-wop backing singers), the production by Foster, and the accompanying musicians gave Orbison's music a "polished, professional sound ... finally allowOrbison's stylistic inclinations free rein". To augment the Nashville sound, Orbison requested a string section in the studio. With this combination, he recorded three new songs, the most notable of which was "Uptown", written with Joe Melson. Impressed with the results, Melson later recalled, "We stood in the studio, listening to the playbacks, and thought it was the most beautiful sound in the world." The Rolling Stone Illustrated History of Rock and Roll states that the music Orbison made in Nashville "brought a new splendor to rock", and compared the melodramatic effects of the orchestral accompaniment to the musical productions of Phil Spector. Orbison continued recording albums in the 1970s, but none of them sold more than a handful of copies, and by 1976, he had gone an entire decade without a charting album. Aside from a few minor hits in Australia, he also failed to produce any charting singles after the '60s. His fortunes sank so low that he began to doubt his own talents and several of his '70s albums were not released internationally due to low US sales. He left MGM Records in 1973 and signed a one-album deal with Mercury Records. Author Peter Lehman would later observe that his absence was a part of the mystery of his persona: "Since it was never clear where he had come from, no one seemed to pay much mind to where he had gone; he was just gone." His influence was apparent, however, as several artists released covers of his songs, which proved popular. Orbison's version of "Love Hurts", a song composed by Felice and Boudleaux Bryant and first recorded by the Everly Brothers, was remade by Gram Parsons and Emmylou Harris, again by hard rock band Nazareth, and by blues adept Jim Capaldi. Sonny James sent "Only the Lonely" to No. 1 on the country music charts. Bruce Springsteen ended his concerts with Orbison songs, and Glen Campbell had a minor hit with a remake of "Dream Baby". A compilation of Orbison's greatest hits went to No. 1 in the U.K. in January 1976. The same year, he began to open concerts for the Eagles, who started as Linda Ronstadt's backup band. Ronstadt herself covered "Blue Bayou" in 1977, her version reaching No. 3 on the Billboard charts and remaining in the charts for 24 weeks. Orbison credited this cover in particular for reviving his memory in the popular mind, if not his career. He signed again with Monument in 1976 and recorded "Regeneration" with Fred Foster, but it proved no more successful than before. Lynne later spoke of the recording sessions: "Everybody just sat there going, 'Wow, it's Roy Orbison!'... Even though he's become your pal and you're hanging out and having a laugh and going to dinner, as soon as he gets behind that and he's doing his business, suddenly it's shudder time." Orbison was given one solo track, "Not Alone Anymore", on the album. His contributions were highly praised by the press. Traveling Wilburys Vol. 1 spent 53 weeks on the U.S. charts, peaking at number three. It reached No. 1 in Australia and topped out at No. 16 in the U.K. The album won a Grammy for Best Rock Performance by a Duo or Group. Rolling Stone included it in the top 100 albums of the decade. Orbison admitted that he did not think his voice was put to appropriate use until "Only the Lonely" in 1960, when it was able, in his words, to allow its "flowering". Carl Perkins, however, toured with Orbison while they were both signed with Sun Records and recalled a specific concert when Orbison covered the Nelson Eddy and Jeanette MacDonald standard "Indian Love Call", and had the audience completely silenced, in awe. When compared to the Everly Brothers, who often used the same session musicians, Orbison is credited with "a passionate intensity" that, according to The Rolling Stone Illustrated History of Rock and Roll, made "his love, his life, and, indeed, the whole world to be coming to an end—not with a whimper, but an agonized, beautiful bang". ^ Both Orbison and Cash mentioned this anecdote years later, but Phillips denied that he was so abrupt on the phone with Orbison, or that he hung up on him. One of the Teen Kings later stated that the band did not meet Cash until they were on tour with Cash and other Sun Records artists. (Amburn, pp. 42–43). 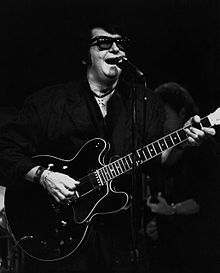 ^ 100 Greatest Singers of All Time: Roy Orbison, Rolling Stone website (2009). Retrieved on October 3, 2011. ^ Pond, Steve (January 26, 1989). "Roy Orbison's Triumphs and Tragedies". Rolling Stone. Retrieved August 15, 2014. ^ History Maker, Roy Orbison website (2012). Retrieved on April 12, 2012. ^ Orbison later said that he "couldn't overemphasize how shocking [Presley] looked and seemed to that night". Clayson, Alan, pp. 26–27. ^ DeCurtis and Henke, p. 153. ^ Fremer, Michael (January 1, 2006). Recording Elvis and Roy With Legendary Studio Wiz Bill Porter — Part II, MusicAngle.com. Retrieved on February 8, 2011. ^ a b Roy Orbison, Rock and Roll Hall of Fame (2007). Retrieved on May 21, 2009. ^ a b Whitburn (2004), p. 470. ^ "Roy Orbison". IMDb. Retrieved August 29, 2015. ^ "Top 10 Oldies Myths - Urban legends and other misperceptions about early rock and roll: Myth#2: Roy Orbison was blind". Oldies.about.com. Retrieved July 4, 2014. ^ a b Brown, Kutner, & Warwick, p. 645. ^ "45cat - Roy Orbison - Ride Away / Wondering - London - UK - HLU 9986". 45cat.com. Retrieved August 29, 2015. ^ Clayson, Alan, pp. 135–136. ^ Émanuel Champagne. "Roy Orbison Songs Catalog". Goplanete.com. Retrieved July 4, 2014. ^ a b c Grammy Award Winners (Past winner search=Roy Orbison), Grammy.com. Retrieved on May 30, 2009. ^ "Biography | The Official James Burton Website". James-burton.net. August 21, 1939. Retrieved July 4, 2014. ^ Sean Michaels (2014-03-21). "Unreleased Roy Orbison track resurrected by singer's sons". Retrieved 2015-10-07. ^ Tuttle, Mike (March 19, 2012). Bruce Springsteen Schools ‘Em At SXSW 2012, WebProNews. Retrieved on March 22, 2012. ^ Scheff, Jerry (2012) Way Down: Playing Bass with Elvis, Dylan, the Doors & More. Backbeat Books. Page 33. ^ a b Lehman, p. 20. ^ a b Watrous, Peter (July 31, 1988). "Roy Orbison Mines Some Old Gold", The New York Times, p. 48. ^ a b Roy Orbison, Nashville Songwriters Hall of Fame (2008). Retrieved on May 30, 2009. ^ Roy Orbison: Songs We Love, NPR (April 27, 2011). Retrieved on April 29, 2011. ^ Lang, k. d. (April 15, 2004). 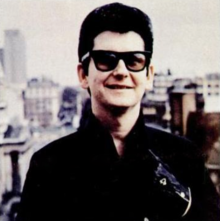 The Immortals — The Greatest Artists of All Time: 37) Roy Orbison, Rolling Stone. Retrieved on June 2, 2009. ^ Roy Orbison, Songwriters Hall of Fame website (2009). Retrieved on May 30, 2009.